Did Pride manage to continue on with the team? 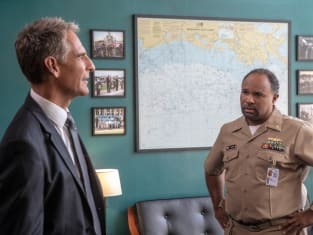 That was his plan on NCIS: New Orleans Season 5 Episode 6 when he met up with his friend, Commander Calvin Atkins as he continued to struggle over his recent brush with death. Meanwhile, the NCIS team uncovered evidence of a suspect who was harvesting organs from multiple victims. Also, Pride's assistant, Ginny Young was badly shaken up after escaping from a kidnapper. I am willing to do whatever it takes. Just like you, Agent Pride. Permalink: I am willing to do whatever it takes. Just like you, Agent Pride. Calvin: I couldn't wait that long to see Dwayne Pride in a suit and tie. Pride: It almost makes me look respectable. Permalink: It almost makes me look respectable.